We’re readjusting to Glendale life after the incredible luxury of Sedona, Arizona. 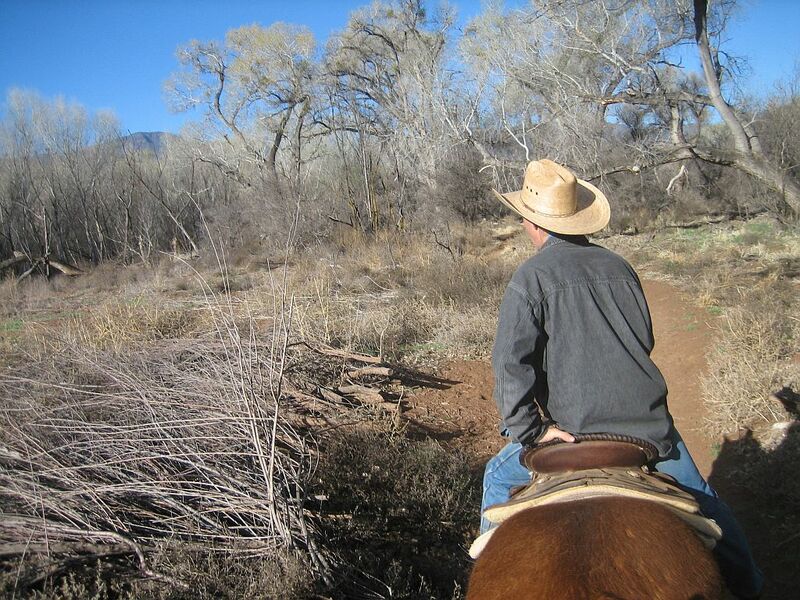 I’m reliving all the great times we had there, including my horseback ride on the last day of our trip. 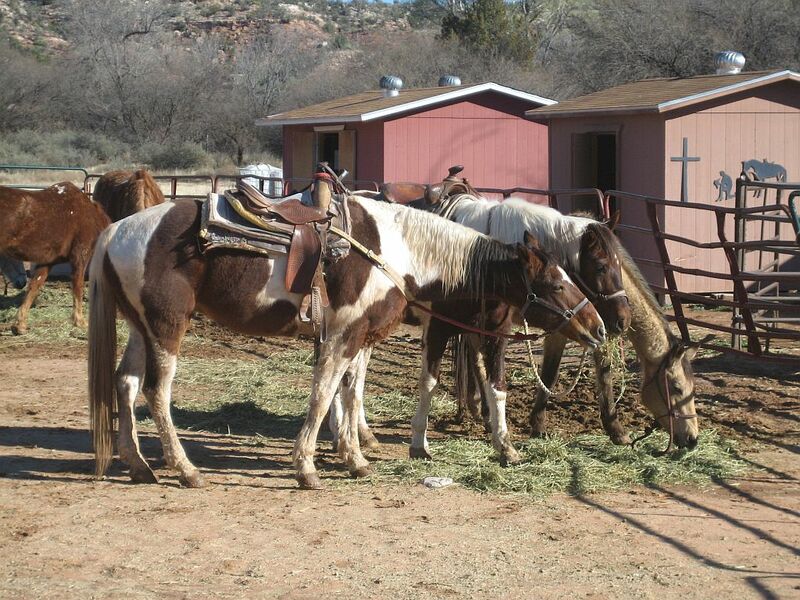 Above, you’ll see a picture of “Hawaii”, the paint I rode along the trails of Dead Horse Ranch State Park near Cottonwood. That was a gentle and easy horse to ride. Here’s a shot of A.J., my wrangler. He’s telling me a story of the cottonwood tree in the upper right hand corner of the photo. It was called “Hangin’ Tree”, and evidently that’s where horse thieves and rustlers were strung up without a jury trial back in the day. A.J. taught me a horse fact I’d always wondered about. When Hawaii made that snorting noise that horses make now and then, I asked A.J. what that sound signified. “It’s just the horse sneezin'”, replied my guide. A horse sneeze is pretty big and loud; imagine a horse size Kleenex tissue to go with it! I reported in the previous post that we saw two bald eagles in a cottonwood, and passed the entrance to an Indian cave dug out pretty high in a cliffside. As much fun as showing “Some Other Cat” was to an audience, riding “Hawaii” on an early morning Cottonwood trail is the experience that just won’t leave me. Here’s some comics that A.J. probably wouldn’t care to read, Krazy Kat from 4-6 to 4-11-1942. 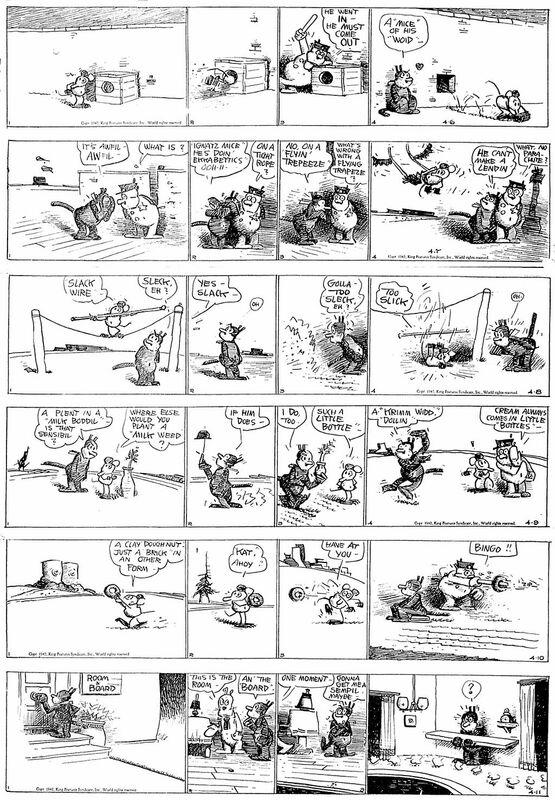 Every strip is a pun or a Karom shot off Krazy’s Kat Langwich pronunciations of words. The 4-9 is my favorite, a “Krimm Widd” comes in a small bottle, as opposed to a “Milk Widd” which comes in a standard size “Milk Boddil”. There is also the humor gleaned from the words “Slack” “Slick” and “Sleck” in the 4-8, an example of Krazy’s mangled syntax. Myrtle comes to you from 12-29-47 to 1-3-1948 this time. Snoggons adopts an Eskimo dog named “Ebuceci”, which goes right along with a boy who’s name is the same spelled forward or backward. Dudley Fisher gets a whole week of gags out of this strange dog, the best being the Saturday 1-3, as Freddie shoos Ebuceci out of his favorite chair, only to find that the frigid temperature of the Eskimo dog’s body has made the chair too cold to sit in! In Felix, from 3-26 to 4-1-1934, Danny’s Dad tries to protect the kids from an evil looking man who is apparently hanging around their window, peeping into the house. It turns out to be just another manifestation of Felix’s collection of rejected oil paintings from his friend Rembrandt, introduced in previous posts. The Saturday strip has Felix hiding from a Stork under a painting of a fish, not a good choice. This set of dailies has Felix in only three out of the six strips. Messmer dropped the Cat from his own strip every once in awhile when the story called for it. The Sunday page continues Felix’s journey through the signs of the Zodiac, visiting Sagittarius, the Archer. In a silent cartoon type gag, Felix steals an arrow from the sleeping Sagittarius and shoots himself onto the planet Pisces, in search of food, almost always the prime motivator for anything Felix does. Here are the Yogi Bear Sundays from April of 1964, more of the work of Harvey Eisenberg, who drew the style we associate with “Hanna-Barbera” better than almost anybody. We really should call this style “Eisenberg”, to be fair. About the earliest vestige I’ve seen of Harvey’s style is in the “Red Rabbit” and “Foxy Fagin” comic books of the late 1940s which Joe Barbera and Eisenberg produced together, during production of the Tom and Jerry cartoons. My favorite of this batch is the 4-26-1964 page, which features many Hanna-Barbera animals, such as Chopper and Yakky Doodle, Augie Doggy and Doggy Daddy, Baba Looie, Blabbermouse, Snagglepuss, Mr. Jinks (colored brown, not his usual orange) , and Hokey Wolf (also brown, in this case easy to confuse with Jinks). In the silhouette panels, you can make out Quick Draw McGraw standing tall under the umbrella, and a few generic H-B/Eisenberg animals squeezing into the act. When Yowp gets around to posting the half-page version of this strip, we’ll see who else makes a cameo. Keep checking out his blog at: http://yowpyowp.blogspot.com/. I’ll bet A.J. never visits Yowp’s site either. When we touched briefly on the subject of computers during our ride, A.J. just sniffed, and muttered “throw ’em in the ocean.” I’m inclined to agree with him. This entry was posted on Thursday, March 27th, 2014 at 2:21 am and is filed under Uncategorized. You can follow any responses to this entry through the RSS 2.0 feed. You can skip to the end and leave a response. Pinging is currently not allowed.